None of this feels authentic to me. The entire movie feels much like her grand finale - choreographed. 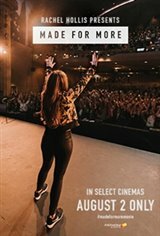 I can appreciate Rachel Hollis' desire to empower women and the world. THAT is awesome and I wish her continued success, but lose the coaching pitch (I felt "sold" to) show us your truth. More than the orchestrated and rehearsed version presented on screen. I appreciate her enthusiasm and that she’s attempting to reach out and help women, but her communication style doesn’t resonate with me. She’s very long winded and repeats herself several times. In the end it was a giant sales pitch to join her coaching service. Might be good for someone young and starting out that feels lost and needing direction. Best way to start the year and super inspirational! AMAZING! Motivational and a great girls night flick!